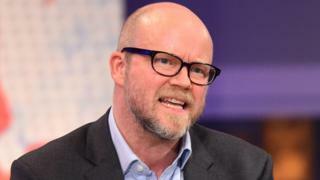 Toby Young has resigned from the board of a new university regulator after more than a week of criticism over controversial comments he made on social media. He is a journalist, his views are well known, but the comments he made on Twitter - even though they were deleted - were enough to sink his chances of staying in the job. If a middle-aged public figure like Mr Young can be unseated by his online presence, how worried should the rest of us be? Most employers will look at a person's online presence before even selection for interview - let alone the final appointment decision. Reed is one of the country's biggest recruitment agencies. Laura Holden, from Reed, says: "Recruiters may review the digital profiles of candidates they're interviewing or looking to hire, as it's a quick and easy way to learn more about the individual." A recent survey from reed.co.uk found that 43% of recruiters check digital profiles often. Other surveys show the vast majority, upwards of 80%, look at least once at a candidate's online presence. And it isn't snooping, it is perfectly legal for a prospective employer - or anyone - to look at whatever they like. David D'Souza, head of engagement at the Chartered Institute of Personnel and Development (CIPD), explains: "That's fine - and they can act on what they see - as long as it is not against the law." He says they need to avoid violating the Equality Act of 2010 - they must not discriminate against people because of a "protected characteristic", which can become clearer online, such as religion, age, ethnicity or disability. Mr D'Souza, says: "For example, if you looked at me and didn't give me the job because you spotted a disability, that would not be OK, but if it was because of a tweet I sent, that's fine, even if that tweet was within the law." For those beginning their careers, what they have done online looms larger when there's little in the way of career experience to guide a new employer, giving new entrants to the job market another major issue to deal with. One simple step Reed recommends is a quick check of privacy settings to ensure that any private material is available to view by friends or connections only. It accepts though that it is easy to overshare personal information. For those whose activities may have spread more widely, there are firms that help people clean up their profiles. One of them is Reputationdefender.com; its director, Tony McChrystal, tries to warn people before too much damage has been done. Some of his time is spent in schools, asking sixth formers to start thinking about the potential audience for their online presence: "You have to show them the case study - the good, the bad and the ugly - you come out of university with just a CV. Recruiters need something more." One of its cases involved a young man who sent a single tweet which attracted a response from a prominent sports personality. The tweet contained several swear words and the response would also have been offensive to some. Although there was little else offensive from this person, it came up in every single Google search as the top mention of his name. He felt it was harming his employment chances. Reputationdefender.com won't identify him, since it has now cleaned up his profile. Mr McChrystal's recommendation is radical. Some might think it takes all the fun out of online activity: "Look at the online presence, Facebook, Twitter, online blog; is there anything there you would not want reading back to you in an interview? "Is there anything you wouldn't want your Mum and Dad to see? Get rid of anything that does not pass that test." Then add some in that do, he says: "Start writing in the things that make you the person you want to be - preferably something you are passionate about." Reed also has similar advice: "Emphasise your strengths and promote your application. Follow important people within your industry and retweet articles to show that you're able to stay current with the latest trends." Bruce Daisley, the head of Twitter in Europe, Middle East and Africa, says the important thing to remember is that what you say online is exactly the same as what you say in real life. "There's no separation between the two things. "And probably one of the most important qualities we can teach kids is the quality of empathy and try to think about the person they're talking about," he told the BBC. However, for those for whom the challenge of cleaning up their profile is simply too much, the current freedom to browse enjoyed by employers may be about to end. A radical shake-up of European data protection laws, known as the General Data Protection Regulation (GDPR), is due to come into force in May 2018. The CIPD's David D'Souza, says although there is some debate about this, the GDPR focuses on what people intended their information to be used for. "There could be an argument from an individual that 'that night in Ibiza, or any other activity that could currently compromise your prospects, wasn't meant to be looked at by a future boss and is therefore private. "It will have to be tested through case law and different organisations are trying to work out what it means but the working party suggests employers will have to be a lot more cautious." That would not have saved Toby Young. There's little to suggest Theresa May was aware of his tweets before the appointment. His views on life, in any case, are pretty widely known, and his career as head of the new student regulator was ended by a general public outcry.